What are the different airline classes? Home Travel Tips & News Travel tips What are the differences between airline classes? Since the first commercial flight in 1914, the airline industry has achieved many milestones, including introducing innovative amenities to entice travelers to fly the friendly skies. Today’s flight experience is, of course, vastly different from the inaugural commercial flight in 1914. One of the most notable differences is how much we pay for our journey and what’s included in the price. Flight prices today are really about getting from point A to point B. Another development has been the introduction of multiple classes of service and the variety of pricing schemes within each fare class, allowing you to only pay for the extras if you choose. We’ve purchased our fair share of seats across all air carriers, and it’s clear not all seats and classes are equal. Here are answers to frequently asked questions about North American airline classes and what you can expect from each class. 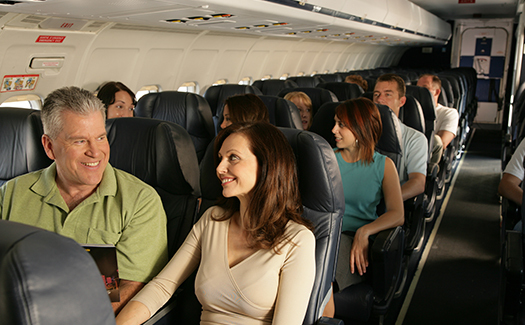 Read on for help choosing a seat, and then find that perfect flight on Cheapflights.com. What are airline cabin classes? What airline cabin classes are there? What can you expect in Premium Economy on North American flights? What does each letter of the fare basis code mean? How do fare class letters and miles work? How can you use fare classes when finding flights? 1. What are airline cabin classes? There are 4 cabin classes offered on most airlines: economy, premium economy, business, and first class. “In the early days, all seats were first class,” said Seth Kaplan, managing partner of “Airline Weekly,” a subscriber-supported publication about the airline business. “In the 1950s, airlines including Delta Air Lines, began experimenting with coach flights at off-peak hours – in other words, not first class and coach cabins separated by a curtain, but entirely separate flights. Later they begin offering 2 cabins on the same flight, as we see today,” said Kaplan. The number of seats increased after deregulation kicked in, calling for more seats to make more profits per flying mile, said Stephen Carbone, who has worked for the National Transportation Safety Board (NTSB) as well as the Federal Aviation Administration (FAA). Depending on the airline, some seats have shrunk over time while others have remained the same across all classes of service. See our guide to how to pick the best airline seat and which airline has the best legroom for secure the best seat. 2. What airline cabin classes are there? While there are 4 airline cabin classes, some airlines only often one — coach. But a seat in coach class on 1 carrier can be vastly different from an economy seat on another airline. Many airlines have the same airplane models in their fleets, but they configure the interiors differently, so it’s important to look at the seating map not only for the airplane type but also the airline you are flying. Using another airline’s map may not be accurate. If your airline doesn’t provide airplane seating charts, call and speak with an agent, who should be able to provide guidance. Economy: Whether you call it coach, standard, main cabin, or “cattle class,” economy is the most basic class. The seats here are the narrowest, ranging from 16 inches to just over 19 inches wide and the seat pitch, the distance from one seat to the seat in front or behind it – what travelers often refer to as “legroom” – ranges from 30 inches to 34 inches. These days, economy offers little more than a seat that will get you from point A to point B. Some airlines like jetBlue and Hawaiian Airlines offer free snacks and beverages and in-flight entertainment systems. 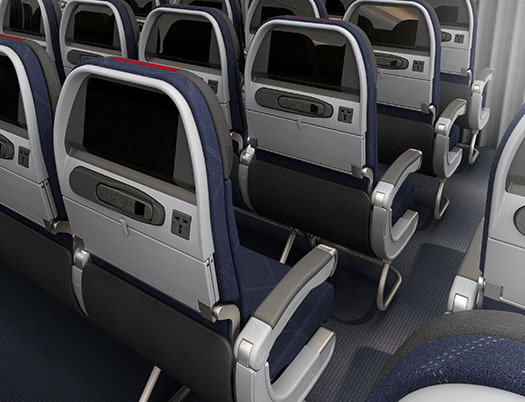 Delta Air Lines offers 3 classes of service: Delta One (180-degree flat-bed seat featuring Westin Heavenly bedding and a dedicated flight attendant on cross-country U.S. flights and long-haul international flights), first class (up to 8 inches of additional legroom, up to 5.4 inch seat recline, and a wider seat-back screen), and main cabin. Main cabin is further divided into 3 “experiences” based on seat size and location: Delta Comfort+, Main Cabin, and Basic Economy. Some low-cost carriers like Allegiant Air, Frontier Airlines and Spirit Airlines only offer coach class. Premium economy: Virgin Atlantic was actually the first airline to incorporate the concept of premium economy back in 1992. Since then, dozens of airlines have picked up the concept. Once only found on international flights, premium economy is widely available on flights within North America. The slightly comfier premium economy offers wider seats and more legroom at a comfier price than business or first class on most airlines. Some airlines categorize economy and premium economy under main cabin. Typically physically partitioned on international and some long-haul flights, the “premium” in premium economy is the added space and sometimes location of seats in more desirable locations, like the front of the aircraft. On international flights, premium economy may not only be physically separate from economy class, but it may also offer additional perks like complimentary or better food, a greater baggage allowance and amenity kits. Premium economy often refers to the “better” seats on an aircraft on domestic flights. 3. What can you expect in premium economy on North American flights? Alaskan Airlines: Alaskan Airlines’ passengers can book Preferred Plus Seats, which are located in row 6 and in the exit rows on select flights. The seats offer the same 3 inches of recline as the standard seats do (except in row 16, which doesn’t recline) but more legroom: a 36- to 40-inch seat pitch. Allegiant Air: Allegiant Air has all-coach configurations on its planes, but select flights offer Legroom+ seating, which offers a larger seat pitch of up to 34 inches, and Giant Seats, which have wider seats, comfy headrests and more legroom. 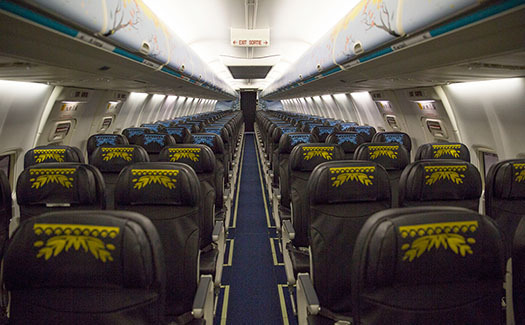 There are 6 Giant Seats per plane, in the front row and mid-cabin emergency exit row, on planes that fly to and from Hawaii and several Western U.S. cities. American Airlines: American Airlines’ Main Cabin Extra offers seats with more legroom at the front of the plane starting at $20. Delta Air Lines: Delta Airlines’ Delta Comfort+ seat offers up to 4 extra inches of legroom, dedicated overhead bin space, and priority boarding. Frontier Airlines: Travelers who opt to upgrade to Frontier Airlines’ Stretch seating get to enjoy in-flight service first, get off the plane first, and sit in seats that are laptop friendly and offer more legroom: 33 inches to be exact on all aircraft types. Hawaiian Airlines: Hawaiian Airlines’ Extra Comfort seating, available only on the Airbus A330, features a 36-inch seat pitch; priority boarding at the gate, complimentary on-demand in-seat entertainment and a personal power outlet. jetBlue: Options for more legroom on jetBlue include Even More Space seats, which offer up to 38 inches of legroom. There are 7 rows of Even More Space seats on the Airbus A320 and both Airbus A321 configurations and 4 rows on the Embraer 190 (rows 1, 12, 13 and 14), offering passengers more legroom, early boarding and more. Porter Airlines: On Porter Airlines, travelers can upgrade to a premium seat, which offers more legroom, at the time of booking for $20 (Flexible and Freedom fares) and $40 (Firm fares). Premium seats are located at the front of the plane (Row 1, Seats A and B; and Row 2, Seats A, B, C and D). Southwest Airlines: There is no assigned seating on Southwest Airlines and all seats are coach class. Southwest’s sole upgrade option is Business Select, which guarantees, among a variety of perks, priority A1-15 boarding, allowing passengers who upgrade to pick the seats they want and have a place to stash their carry-on luggage. Spirit Airlines: Spirit Airlines offers their BIG FRONT SEAT for those who prefer more space. BIG FRONT SEAT options are located in the front of the plane, have a 36 inch pitch and are 25 inches width, with a full 6 inches of additional legroom compared to the airline’s standard Deluxe Leather seats. The BIG FRONT SEAT option can be purchased for a fee during or after booking, based on availability. United Airlines: United Airlines’ Economy Plus seating offer more legroom and wider seats and is available as a one-time purchase or as an annual subscription. 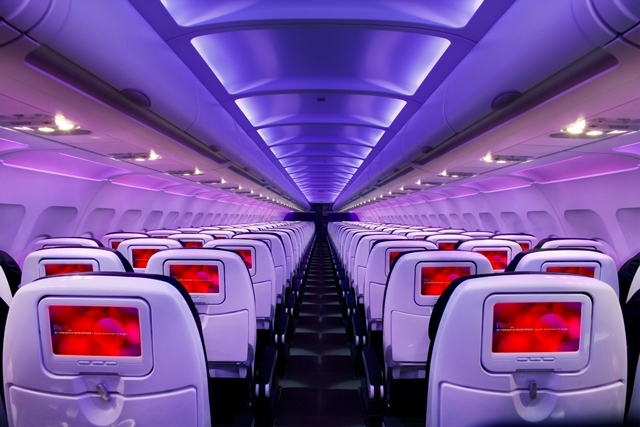 Virgin America: Virgin America’s Main Cabin Select offers roomier seats with a 38-inch pitch (6 extra inches of legroom). WestJet: WestJet’s premium economy fare a Plus seat that affords travelers a variety of amenities, including more legroom. Located in the first 3 rows of the Boeing 737 aircraft, Plus seats have a 36 inch seat pitch. Plus seats are also located in the first four rows of the Boeing 767 aircraft and have a 38 inch seat pitch. Business: The happy medium between coach class and first class is business class. Pioneered by airlines like Pan Am and Qantas, Business class was born after deregulation of airlines when international first-class fares skyrocketed, discounts in economy were common, and full-fare coach travelers were not happy. Business class is a completely different class from economy, and airlines have increased the quality in this category so much that some have replaced first class with business class or, as was the case with now-defunct Continental Airlines, combined the privileges of business class with the luxuries of first class into what the airline called BusinessFirst when it launched in the early 90s. On some airlines like Delta Air Lines, international flights may offer business class service in lieu of first class. The experience ranges from a wider seat that reclines back but doesn’t lie flat, full meal service, in-flight entertainment and an amenity kit on American Airlines, to a seat that converts to a full lie-flat seat, personal minibar, multi-course meals served on fine china and a full bar area complete with bartender and canapés on Emirates. First Class: Passengers can’t get upgraded any further than first class, which is a luxurious experience that varies depending on the airline. 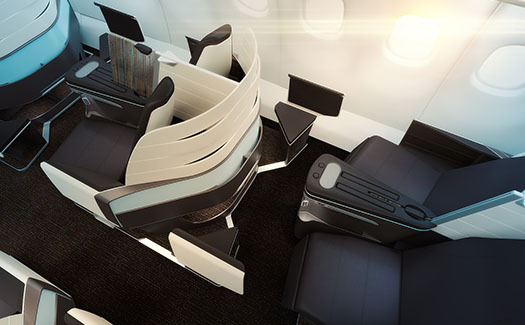 The experience of first class can range from jetBlue’s Mint, which features a 6-foot, 8-inch lie-flat seat with adjustable firmness and a massage feature, a door for privacy, in-flight entertainment and full meal service to Etihad’s The Residence, a 3-room suite with living room, bedroom with a double bed and private bathroom with shower. 4. What are fare classes? The service classes of economy, premium economy, business, and first class are further divided into fare classes, which appear as a letter on your ticket. Each seat on an airplane is put in a fare class, which each come with their own set of rules and price. What might look like a random letter on your ticket is actually a valuable piece of information that shouldn’t be overlooked. The fare class letter denotes information like how much your ticket costs, how many airline miles you’ll accrue for the flight, and the amount of flexibility you have to change your reservation. Airlines, reservation systems and travel agents use fare classes to keep track of tickets sold and fare class availability. This one letter is often the difference between you paying hundreds of dollars more or less for your ticket than the person next to you. Airlines want to get the most they can for each seat while also aiming for a full flight, so ticket prices fall within particular fare classes or buckets to help control inventory and how many tickets can be sold at a particular price. Each fare class has its own price, fare rules, including how much mileage is earned for the airline’s loyalty program and if the ticket can be changed or not. There are also “hidden” fare classes for frequent flyer awards and elite upgrades that are not normally shown in travel searches. To control inventory while aiming to get as many passengers to pay as much as possible, airlines divide the seats into buckets. Airlines use an algorithm that takes into account factors like the number of seats on a flight, departure and destination airports, the time of day, the time of year, and the expected breakdown of leisure and business passengers to determine how many seats get assigned to each bucket for a particular flight. It’s hard to gauge how many seats are allotted to each bucket, but once the seats within a bucket are sold for a flight, the bucket isn’t replenished. To control inventory and maximize profit, airlines don’t release these numbers. Only travel agents and airline staff or travelers who subscribe to services like Expert Flyer can see how many seats remain in each class. Fare classes vary by airline, so it’s important to consult the airline directly for confirmation about what each letter means. The letters within each fare class have a hierarchy. When reading an airline’s fare class chart, read from top to bottom and left to right. For example, on American Airlines, F and J are both full-fare first class/business class, but F is higher than J. Hierarchy becomes meaningful when you’re looking to upgrade or standby for a flight. The fare class code is just the beginning. Each ticket also has a fare basis code, an alpha or alphanumeric code that describes the fare you bought, making it easy for airline staff and travel agents to quickly access the fare rules for a ticket. Each airline sets their own fare class codes that range from 3-8 characters. Almost always, the fare basis code begins with a letter that denotes the class of service. What follows after may refer to the season, how many days in advance the ticket needed to be purchased, minimum and maximum stay requirements, whether a fare is valid on a weekday or restricted to weekends only, or whether the fare is one-way or round-trip. additional fare rules like non-refundable or to signify the fare is a child fare or infant fare. If you have an itinerary made up of multiple fare codes, you may be restricted by the limitations of the most restrictive portion, so check with the airline to ensure you understand the fare rules and restrictions. When searching for airline tickets by classes, you only need to concentrate on the first letter. 5. What does each letter of the fare basis code mean? The all-coach airline offers Giant Seats and Legroom+ seats on select flights for an additional fee. Tickets are classified as Firm, Flexible, and Freedom, which determines fares and rules. Tickets are classified as Business Select, Anytime, Wanna Get Away, Senior Fares, and Rapid Reward Companion Pass. The all-coach airline offers passengers the option to purchase a BIG FRONT SEAT for an additional fee. There are 10 on the airline’s A319 aircraft and 4 on the airline’s A320 and A321 aircraft, according to the airline’s fact sheet. J, C, D = First Class, which includes no change or cancellation fees, 2 free checked bags, meal service, 55-inch seat pitch, 165-degree reclining massaging chair and priority boarding. W = Main Cabin Select with no change or cancellation fees. Z, Q = No change or cancellation fees, 1 free checked bag, free food, drink and movies, 38-inch seat pitch and priority boarding. Y = Main Cabin with no change or cancellation fees and 1 free checked bag. V, B, H, E, U, M, I, L, S, N = Main Cabin with no change or cancellation fees and 1 free checked bag, 32-inch seat pitch, and seat-back entertainment. Tickets are classified as Member Exclusive, Econo, Flex, Plus Lowest, and Plus Flexible. 6. How do fare class letters and miles work? Frequent-flyer miles aren’t based on the number of miles flown. The fare class determines how many airline miles you will accrue for the flight. Some fare classes offer double or triple miles while other classes offer no miles. Depending on your objective, achieving status on an airline or booking the cheapest ticket possible, reviewing the mileage accrual chart for your chosen airline may be an important factor in choosing which flight to book. The following are links to each North American airline’s mileage accrual charts for eligible published fares. These charts denote the relationship between the fare class letters and miles passengers receive who fly in these classes. 7. How can you use fare classes when finding flights? Most airline websites allow for searching for flights by fare class by selecting the advanced booking options. Expert Flyer allows users to search for flights by fare code. When shopping for tickets on airline websites, the fare code is displayed toward the end of the booking process, either when selecting flight options or just before submitting payment. Typically, there is a correlation between the fare class and the price of the ticket; the cheapest fares are the lowest fare classes. Tickets that have more perks and fewer restrictions have higher fare classes (and, most often, higher prices). What fare class do you typically purchase when you fly? Share your preferences in the comments and start your next flight search on Cheapflights.com.